This summer, our favorite food chain is giving our kids the chance to go out, play, and learn something new? 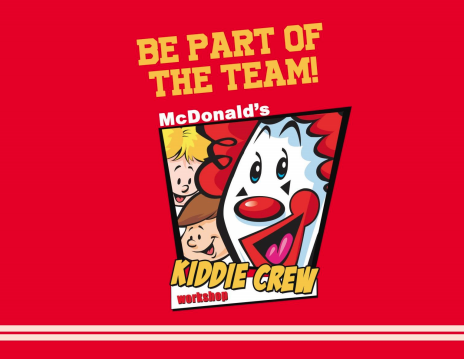 Get your kids ready because the McDonald’s Kiddie Crew Workshop has just kick-off! Now on its 26th year, this annual summer program lets kids aged 6-12 experience all the fun things that make up McDonald’s through play-based activities, allowing them to learn good values, build confidence and discover new talents, all in the company of new friends! The Kiddie Crew Workshop might just be the highlight of your kid’s summer as they experience unique exciting activities like making their all-time-favorite McDonald’s Cheeseburger and serving delighted customers with their orders from behind the front counter or in the drive-thru window! They also get to sing, dance and let their creative juices flow with different activities to make for a memorable summer experience. The Kiddie Crew Workshop starts on April 2, with various workshop schedules you can choose from. The weekday workshop runs for 5 days and each day lasts for 2 hours. Worried about missing out because your weekday schedules are jampacked? Worry no more as McDonald’s adds the new two-day weekend workshops with 3 hours per session. Now, you’re sure to find a slot that will best fit you and your kid’s summer activities!